Looks Great on Your Home, Like Crown Molding. Other systems look out of place, strange, and stick out like a soar thumb. Fully Supported System, absolutely no weaknesses. Some leaf guards have unsupported troughs. Other gutter covers have unsupported hoods. Has No Screen to Clog. All Screens Products Clog, period. No matter how big or small their opening are. Can Handle Any Roof. Other systems can't handle steep roofs, large areas, or heavy rains. The GutterShutter handles them all! Gutter Shutter with its patented 'Gutter Stud' Bracket, its extra thick aluminum material, and its 3 screws per 2 feet attaching it to your home is by far the strongest gutter system available today. Our original 5" version has more capacity than the leading leaf guard systems on the market. Our 6" blows them away. Perfect for steep roofs, commercial applications, and situation that call for MAX capacity. Most gutter guards look strange and out of place. The GutterShutter is designed to look like the gutters you have now but better. This system will look awesome on your home, like crown molding. Isn't it time you put an end to gutter cleaning forever? 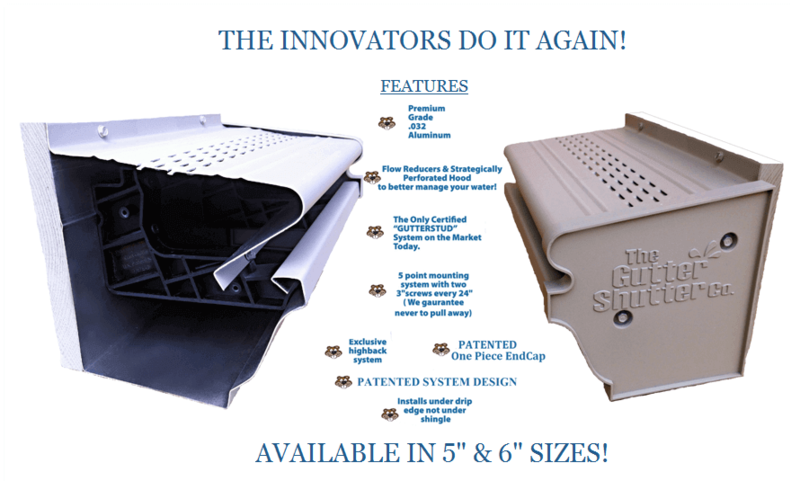 Get a Free Consultation and Price Quote on the Superior Gutter Shutter Clog Free Gutter System. You will be Glad you did. Chicago gutter experts agree, Gutter Shutter is the best system on the market today. However, there are dozens of other products available. Most of them really don't work that well. Others work ok. And then there are some that work great year after year. Below is a brief recap of the different types of products available categorized by type. Read these gutterguard comparisons carefully before you choose your new roof management system. The Gutter Shutter has been a tried and true leaf protection system in the Chicago area for over 10 years. It is a solid hood system that works on the principle of water adhesion. Rain water follows the hood and flows into the trough while leaves, branches and debris fall over the edge and down to the ground. This product is one of the strongest, if not the strongest on the market. It's solid vinyl bracket known as the "Gutter Stud" gives the system it's support. The Stud is attached to the house with 2- 3" galvanized screws every 2 feet. Then the hood is attached to the Stud and the house with 1" galvanized screws at the same 2 foot intervals. Combine the support of this marvel of engineering with the extra thick aluminum stock that is used to form the components of this system and you have a system that is so strong that you can literally do pull-ups on it! The Guttershutter system also has the highest capacity of any leaf shedding product available. The 5" version, which has a higher capacity than most, is perfect for standard residential gutter applications. But it gets better... Gutter Shutter is also available in a larger, higher capacity 6" version which is great for larger homes, steeper roofs, and commercial gutter applications. Either way, you get the capacity you need to protect your home in even the heaviest of rainfalls. Most homeowners when shown pictures of all the different types of gutter protection systems, choose Gutter Shutter as the most attractive. Why is this? Because the GutterShutter System was designed to look like rich crown molding on the exterior of your home. There is a reason why standard open trough gutters look the way they do, for aesthetics. Regular K-style gutter look like molding. Gutter Shutter maintains that traditional look while at the same time enhancing it. Giving the exterior of your home the same effect that wider, more detailed wood moldings give the interior of your home. The curb appeal of your home will never look better! None that we found, schedule an appointment to see this amazing product for yourself. Our second favorite leaf guard system is Leafguard. It works on the principle of water adhesion just like GutterShutter and it can be effective as a leaf and debris shedding gutter product. Some of the issues that need to be considered and explored with this product when you are researching are its small size/small capacity, its non-traditional appearance, its unsupported trough, and its unusually high price tag. When a homeowner switches from a standard K-style or Ogee open trough gutter product to the Leafguard they are actual loosing capacity because of this products smaller size. A standard K-style gutter is 5" at its widest point, the Leafguard is only approximately 4.5" wide. The question that comes to mind is what if we have a hard rain? Will this product handle it? And what if your roof is steep, will this product handle the flow? Appearance is obviously subjective. But for a homeowner trying to keeping the traditional look of their existing gutters, this product may not be the right choice. The question is, do you want your home to look uniform and traditional or are you ok with a gutter system that will change the look of your home? Most homeowners are not engineers so this one may be missed quite often, but if you look at the design of this product, ask yourself, how is the trough (the section that holds the water) supported? In actuality the only support is the metal itself. And as most folks know the material gutters are made from, Aluminum, bends pretty easily. Ask yourself, will this design hold up to the weight of water over time? What is keeping the opening along the front a consistent size all the way down a long run? Will the trough sag over time causing the opening to become so big that leaves and debris can get in? And finally when considering this product, you need to ask yourself, how much of the price ($40+ per foot) is due to sales commissions, advertising on TV, Radio, and in Magazines, or brand name recognition? Because when an expert examines the product they quickly see it uses less material than most, the bracketing system is made from relatively cheap material, and the installation is one of the easiest which cuts down on labor costs. Simple economics tells us this should make the product less expensive. What are you paying so much for? Price, Up to $40 per linear foot plus accessories. Screens have been around probably as long as gutters themselves. Anyone who has ever tried screen products knows that they don't work. One of two things eventually happen, debris gets through the screen and clogs the gutter or the screen itself clogs. But as with everything there are people out there that try to reinvent the mouse trap, and today a new generation of screen has been introduced to the market. These are called micromesh screens because their screening material is made of a fine steel mesh material. Screens that you buy at Home Deport or Menards are notorious for letting debris get into your gutter. The openings in the screen are large enough to allow small pieces to slip through and accumulate in your eaves trough. This creates more work for the homeowner because now the screen has to be taken off, then the gutter needs to be cleaned, then the screens need to be put back on. Micro Mesh screens actually do solve this issue. Absolutely no debris gets through so your gutter will never clog. The problem is sometimes water doesn't get in either. And eventually with roof gravel, decaying leaves, and tree sap, the screens, not your gutters, will clog. Here is the issue, the openings in the screen are so small that during hard rains the water shoots over the screen instead of going into it. Again, water adhesion at work. The rapidly moving water molecules stick together and form a sheet that doesn't drop into the screen openings. This obviously gets worse the more clogged the screen gets over time making it necessary to get up on the roof or on a ladder to clean the screens off, pretty much defeating the purpose of the product. You also have to be careful because some of these companies give deceptive guarantees. They say if your gutters ever clog they will refund your purchase. They can offer this spectacular guarantee because they know the screen will clog way before the gutter. And guess what, they don't guarantee against the screen clogging so you are on your own to clean it. We at Gutter Shutter Chicago have a confession to make. We too got caught up in the hype of micro mesh screens. About 5 years ago we became the sole Chicagoland dealer of a product called Gutter Dome. We thought we would offer our customers who were in love with their existing gutters a cutting edge product that would keep their gutter clear while at the same avoid full replacement. As far as these products go, the screen product we offered was as good or better than the rest. The problem, our consultant couldn't sell it! The fundamental truth is screens will always clog, no matter how fine the screen is. Our sales force just couldn't get behind the concept of the product. They believe so strongly in the Gutter Shutter that after only a year of offering the product we stopped. The first solid cover leaf protection product ever invented was the Gutter Helmet. This product took the market by storm because for the first time there was an alternative to a screen. Instead of a cover with holes in it that gets clogged, they were made from a solid piece. Water clings to the hood, around the curve and into the gutter while leaves and debris fall to the ground. This was a little over 30 years ago. Since then dozens of these type of products have come and gone. These gutter cover products are designed to retrofit over existing gutters or over new standard 5" k-style gutters. The "hood" attaches to the front of the gutter either directly or with a bracket and the rear of the hood attaches under the second course of shingles. This installation design is the biggest drawback of these products because: 1. it makes the hood look extremely large and 2. the product is secured to the roof using screws or nails. These fasteners over time can let moisture through the shingle causing roof failure and leaking. It may also void your roofing warranty because nails in these location are not part of standard roof installation procedures. Another major set back this type of gutter topper product tends to have is they are generally made of thin metals and have weak brackets. This makes the hoods easy to damage when you lean a ladder on them or when tree branches fall on them. Overall a good idea with a bad design. Water adhesion works but nailing into shingles, weak materials, and the fact that these companies often go out of business, makes this alternative to gutter cleaning a good one to avoid. Since the first eave trough was attached to the fascia board of a house that trees around it, mankind has been trying to find a solution to the age old question, "how can one keep leaves and debris out of a rain gutter so it does't need to be cleaned?" And like any fundamental problem of human existence, there has been by far more crack pot ideas than good solid solutions. Take for instance the plastic Home Depot / Menards Gutter Screen. For decades homeowners have attempted to keep their gutters free flowing with these contraptions. In Chicago it has become a right of passage. You buy your first home, you clean your gutters a few times and hate it, you install plastic screens, you regret it and look for another solution. You have to replace them all the time - The plastic deteriorates and sags over time with exposure to sun and weather. You still have to clean your gutters - The openings are large enough to let debris through them and into the trough. You create more work because you have to actually clean the screen - The openings are big enough to allow twigs, seeds, and leaves to get stuck in them, clogging the screen. You are work harder - Pieces constantly blow off and end up in your yard. You are never fully protected - If they don't blow off, they shift position and create large holes where debris gets in. Over the years our dumpster has overflowed with the hopes and dreams of thousands of Chicagoland homeowners. What we have been told countless times is gutter screens are more of a hassle than a real solution. Over the years there has been literally hundreds of leaf protection products introduced. Some of them are just plain funny. We call these gimmicks because they are just ridiculous. How about a battery operated gutter robot machine that runs down your gutter and flips the debris out? How about... can't go around corners, can run through thick gutter muck, and everything it flips out of your trough is falling all over your house and things around your house. The Gutter Brush or the Gutter Worm is like a giant pipe cleaner that sits in the trough. The theory is the water will trickle through the bristles and the leaves will stay on top. The problem, the brush doesn't fill up the entire trough leaving lots of room for debris to accumulate on top of and around the product. Small debris also accumulates in bristles. The product will eventually need to be removed and cleaned defeating the purpose. Where do the Gutter Brackets Go? Tube is a pvc tube with holes in it. Almost the same idea as the brush but this time the water flows in the holes and the leaves and debris sit on top. Again the tube doesn't fill the entire trough because it is round. Tree debris accumulates on the sides and piles up. When leaves start to decompose they turn into a mushy muck. This material fills the holes and they eventually clog. Fortunately we haven't seen this product much. Probably because it doesn't even look like it would work. Here is a product that we actually see all of the time because we remove so much of it. Readily available at major retailers, big box stores, and warehouses, the Gutter Sponge is a triangle shaped piece of plastic mesh. Unlike the worm and the brush this product actually fits the profile of the K-style gutter much better. So why do people replace this product? Because it doesn't work. The material that sponge is made from is some sort of vinyl that is form ed into a web that is supposed to act like a filter. This is a bad idea for two reasons. The thinner vinyl is the weaker it is and the quicker it breaks down from the sun's UV rays, temperature, and weather conditions. Because of the way it is formed, the material in this product actually starts to break down within the first year. By year 2 or 3 it is rigid, brittle, and falling apart. Filters are made to do one thing, separate solids from liquids. And this product does that. In the beginning, the water goes through the sponge and the debris is caught up. Like any filtration system however, the filter will eventually clog up and need to be change. This product is no exception. When the sponge is clogged with debris it needs to be changed. The craziest thing about this product is it's price. There are several manufacturers pushing it and prices range from $8-$12 per linear foot. For a product that will in most likelihood only last one good season, these prices are not justified. When they fail may damage your home caused by clogged gutters.